Muse is a freeform tool targeted to graphic designers and artists whose work has thus far appeared only in print, but who want to create interactive websites without having to deal with code. Adobe envisions the Muse designer as someone who spends most of their time working in Photoshop, Illustrator, and InDesign. 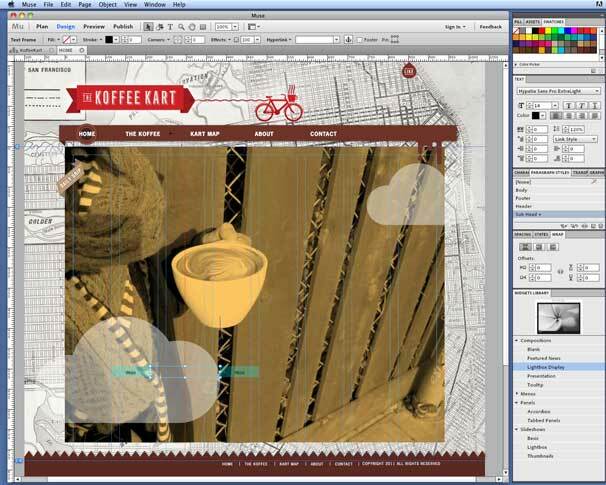 Creative pros will be able to use their current skills to combine images, graphics, and text in a process that is similar to working with InDesign. "Muse was built with the print designer in mind," said Danielle Beaumont, group product manager at Adobe. "It allows designers who are not coders to create unique, professional websites as easily as producing a layout in InDesign. This is an end-to end-solution with interactive elements like slideshows, tool tips, remote rollovers, and lightboxes....It allows the designer to do things that only a hand-coder could do." In an authoring environment looks like a cross between InDesign, Fireworks, and Dreamweaver, Muse provides a library of fully customizable, pre-coded widgets for creating interactive site elements. These drag-and-drop widgets let you create lightboxes, accordion panels, and navigation menus, among other things. Such interactivity can be visually designed without having to hand off the site to a team of professional Web coders. Muse automatically generates all HTML, CSS, and scripting for the design, and allows users to publish from within the program. Muse also features easy-to-use sitemaps, master pages, and flexible tools to make planning a site layout fast and intuitive. In addition, Muse lets users embed commercially available code from places like Facebook, YouTube, and Google Maps to extend Muse capabilities beyond the application's widget library. This functionality, which Adobe calls "arbitrary HTML embedding" lets users paste code from the clipboard onto the Muse canvas. The program can interpret the code as a map or video or Facebook Like button, for example. While Adobe hopes that sites created with Muse will work well on tablets and mobile phones, there is no formal support for such devices for the launch. The company says that after the commercial version is released, it will explore ways to let users customize sites for various platforms and devices. Muse does not build dynamic database driven sites. In addition to the Web authoring software, Muse provides Adobe Web hosting for testing, staging, and reviewing Muse sites. After the development phase is completed, the designer can either convert it to a paid Adobe-hosted site, or export the site via FTP to another Web host. "This is a creative app that lets you begin with a blank canvas. We want people to walk in and plan, design, preview, and publish their site all in one streamlined effort. Published sites can be hosted on Adobe's hosting platform, or any other third-party hosting platform by way of FTP upload," Beaumont said. While there's no requirement to use Adobe's hosting service for the features offered in the current version of Muse, Adobe is planning to add CMS-based features such as blogs, contact forms, FAQs, and shopping carts to Muse in future versions, and those elements will require the sites to be hosted on the Adobe Business Catalyst platform. That's because such CMS-based services will require specific back-end support and integration between Muse and the back end server. "Adobe realizes that in addition to the static design features that Muse will offer in its initial release, websites are moving to CMS-driven features...Over time, Adobe would like to leverage the Adobe Business Catalyst CMS feature set to deliver additional functionality above and beyond the static feature set we are demonstrating today," Beaumont said. "At that time, Muse users could choose to use these dynamic features which would only work on the Business Catalyst platform." Business Catalyst is Adobe's business platform featuring e-mail marketing, customer response management, eCommerce, forums, and analytics. Over time, Muse will highlight more Business Catalyst functionality, but users will also be able to create non-CMS sites that can be hosted anywhere. 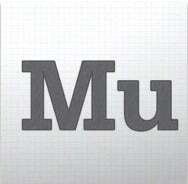 Muse is scheduled for commercial release in the first quarter of 2012. It will be available via subscription only at $15 per month or $180 per year. A month-to-month subscription is $20. The rationale behind offering Muse only as a subscription is that it allows Adobe to make improvements to the software more quickly and to be more responsive to user needs, browser and device compatibility issues, and design trends. Adobe plans to update Muse on a quarterly schedule rather than the yearly, 18-month, or two-year schedule that is traditional for major software. Muse requires a dual core Mac running OS X 10.6 or higher and Adobe AIR 2.7 or higher. The program is cross-platform. Complete system requirements are listed on Adobe's website. Adobe has set up a website where interested parties can download the free beta, view a gallery of Muse-created websites, and access instructional tutorials. Some 40 websites designed with Muse have already been published by Adobe's pre-release community.